Now this is a Horror cult classic! I haven’t seen a movie like this in years! It was certainly a great surprise! While people compare this movie to Gremlins I guarantee you it is nothing like Gremlins. This movie is its own movie! The acting was top notch, even when there were elements of cheesiness that occurred they all managed to keep it great! The director also did “Trick Or Treat” which is another Halloween cult classic. But Krampus surpasses “Trick Or Treat” by a long shot. The story was good, and it keeps you really glued to the screen wandering what will happen next. There are also many scenes that are hilarious. Most of the humour came from Aunt Dorothy. Many people online will complain that the characters/actors were too unbelievable and so unlikeable. This is the whole point of the movie. This is a story of a broken with family with no love, no respect and no desire to love Christmas. 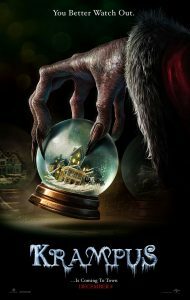 And then Krampus comes to town! The Practical Effects were used so well. I like the fact there was no CGI used for this movie (with the exception of the Ginger Bread Men). It’s kept old school, and it never fails to amaze us. Without spoiling anything…the story does start out quite slow. But as soon as the blizzard hits…you know you’re in for the roller-coaster ride. Kramous’s minions are awesome and scary, to say the least! When Krampus’s appears his face will give you nightmares! The ending was very original and very unexpected. I really hope this becomes a movie (like Home Alone) that comes on TV every year for all of us to appreciate the spirit of Christmas! All in all, it is a cult classic and it was quite a surprise on how good it was. Had no idea this would be a movie I would love so much.